What is eating the leaves on my roses? Good evening and thank you for using Ask an Expert. It looks like rose Chafers have attacked your roses. I am sending some information that will be helpful to you on controlling these critters. All insects do a very good job of keeping their appointments. Each year, they show up to eat and mate within a week or so of the previous year’s engagement. Rose chafers are currently keeping their appointments across southern Michigan with much gustatory glee. Rose chafers, Macrodactylus subspinosis, are medium-sized beetles that are five-sixteenths to .5 inches in length. Their color is pale green to tan with reddish brown to orange-tinged spiny legs. When you see them, they are engaged in their two favorite activities: eating and mating. Finding them in a happy pile is a regular occurrence. 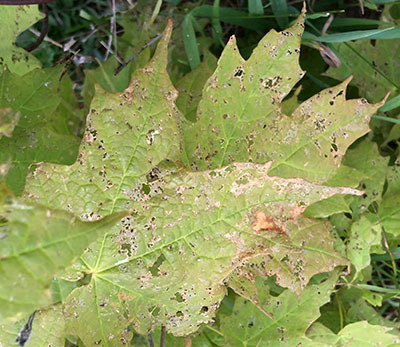 Michigan State University ExtensionHorticulture Educators and Master Gardener Hotlines are currently answering questions about this voracious, amorous pest, which is having a very good year in some areas. They have their biggest populations on sandy soils. Rose chafers begin life as larvae in soil and feed on various roots but do not damage lawn grasses. They spend winter below frost line in soil and emerge as adults in southern Michigan, usually in late May. This chewing beetle is noted for a wide and varied diet. Rose chafers feed on flower blossoms, especially peonies and roses, from which they get their name. But they do more than just chafe. The beetles munch large, irregular holes in plant leaves and flowers and they also strip off the top layer of leaves in an act described as skeletonizing. No one is interested in the large, tough veins, though. Rose chafers feed on grapes, raspberries, strawberries and other fruit, creating enough damage to make the fruit unusable. There are many tree and shrub leaves that are also worthy inclusions in their diet. An example of skeletonizing on a maple leaf. Rose chafers have another annoying habit of flying when disturbed and landing on your hair or clothing. They become entangled even in the shortest of hair. They become especially irritating because they climb up people’s legs under their pant legs, scritching and scratching as they climb. Pulling one’s pants down in public is still frowned upon, so be aware, it could happen to you. Rose chafers are poisonous if eaten. If you have dogs or chickens, they should not be consuming them. Birds make a point of avoiding them. Control can happen through several methods. In small numbers, rose chafers can be hand-picked and dropped into a bucket of soapy water so they sink. Or a barrier of cheese cloth or floating row cover material that is secured to the ground can exclude them for the four or so weeks they are feeding. Pesticides with the active ingredients of cyfluthrin, imidacloprid, bifenthrin, permethrin or carbaryl can be used for large numbers. But if this is an edible crop, use particular care in pesticide selection. Your choice must be approved for use on food crops. Smart gardeners select the best option for their plants based on how severe the rose chafer invasion is. Good luck with your treating your roses.